Earlier this week, Girls’ Generation headed out to Hong Kong for overseas promotions. For their trip, the girls accessorized with various sunglasses from Ray Ban. 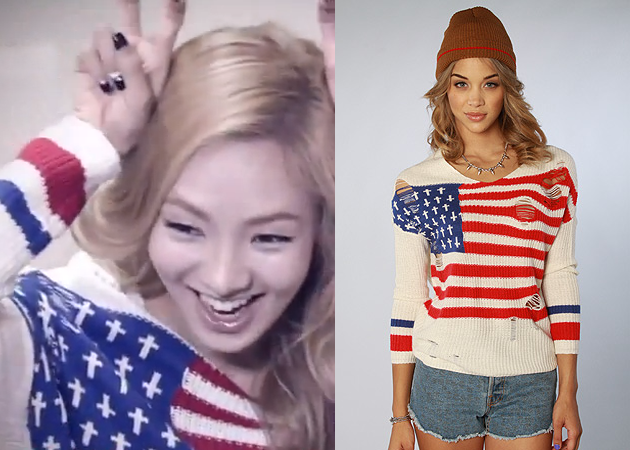 Hyoyeon wore my favorite pair, the 59mm Cats 5000 Sunglasses , which is currently available at Karmaloop for $185.00. A bit pricey, I know, but Rep code Kstyle can save you up to 20% off your purchase. Not to mention, all orders over $50 receive free shipping with code KLSPRING. Only 5 left in stock! We all have seen our favorite stars rock Beats by Dr. Dre headphones both on and off stage, but lets face it…up to $450.00 for a pair of headphones doesn’t fit in most of our budgets. Though, there is an equally popular and stylish brand of headphones that have made it’s way onto the Kpop scene: Urban ears. The headphones have been seen on idols such as Joo Yeon of Jewelry, Dara of 2NE1, Hyomin of T-ara, Donghae of Super Junior, Hyoyeon of SNSD, Jang Geun Suk, Nichkun of 2PM and many more. Urbanears carries four different styles, the most popular is the Plattan. (Worn above by all) The headphones come in 16 shades and retails for $60.00 at Karmaloop.com. A fraction of the price of the Beats headphones! For additional savings use repcode Kstyle for up to 20% off your purchase! Happy Shopping! I’m planning on getting a pair really soon, but I can’t decide which color to choose. Pool or Pistachio? A quirky video of SNSD members Jessica and Hyoyeon at Incheon International airport has been putting a giant smile on the faces of fans everyone. Though I can’t deny fellow Jessica’s beauty and charm, Hyoyeon really caught my eye. Hyoyeon has recently become my favorite Airport Fashionista and her July 8th look is anything but short of chic. Her look was made up of the Rayban 52mm New Wayfarer Sunglasses ($119.00) and the Wildfox Raven Surf Raglan ($85.95) Both items can be found at Karmaloop. On June 10th SNSD‘s dancing queen, Hyoyeon updated fans with a selca of herself on SM TOWN‘s facebook page, documenting the Entertainment’s concert in France. In the photo the beauty wore the popular Red Sparkle Heart Baggy Beach Jumper ($80.95) from one of her favorite brands Wildfox. Luckily, Karmaloop literally JUST put this item back in stock and for 25% less too! Great timing, right? If you want additional savings on this sparkly number use repcode, Kstyle at the checkout for up to 20% off. Happy Shopping! SNSD/ Girls Generation have left a big impression during their promotions in Japan, so it is no surprise the girls landed themselves a spread in the February 2011 issue of Japan’s Glamorous Magazine. For their spread the girls were styled in simple graphic tees from the Wildfox Spring Summer 2011 collection. Shop Wildfox at Karmaloop.com, here. Remember rep code, Kstyle will save you 20% off your entire purchase!